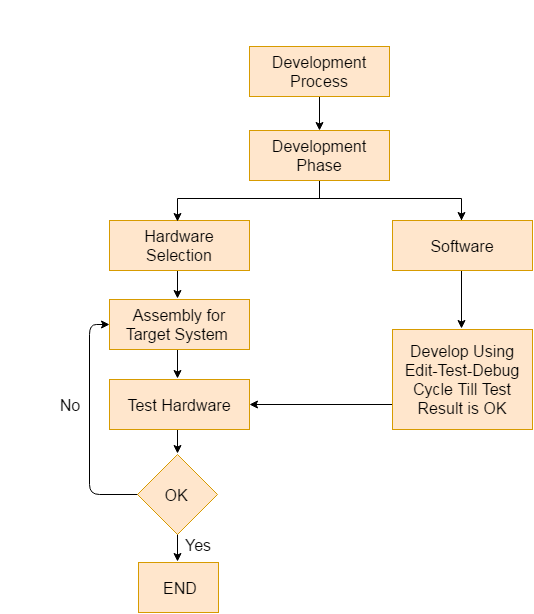 Let's see the block diagram shows the basic structure of an embedded system. Sensor: Sensor used for sensing the change in environment condition and it generate the electric signal on the basis of change in environment condition. Therefore it is also called as transducers for providing electric input signal on the basis of change in environment condition. A-D Converter: An analog-to-digital converter is a device that converts analog electric input signal into its equivalent digital signal for further processing in an embedded system. Processor & ASICs: Processor used for processing the signal and data to execute desired set of instructions with high-speed of operation. Application specific integrated circuit (ASIC) is an integrated circuit designed to perform task specific operation inside an embedded system. D-A Converter: A digital-to-analog converter is a device that converts digital electric input signal into its equivalent analog signal for further processing in an embedded system. Actuators: Actuators is a comparator used for comparing the analog input signal level to desired output signal level for providing the error free output from the system. Designing steps required for embedded system are different from the design process of another electronic system.